​Tell us about Strange Space Games and your vision for the games you plan to work on under this name. If I had to make up a mission statement or anything for Strange Space Games, I’d say I’ve been trying to design the games that my friends and I have always wanted to play. Arcane Alley was intentionally light enough not to intimidate our casual gamer friends, while having enough depth to keep our heavy friends engaged. I mean, really, we all just wanted to hang out and do something together, so having a game everyone could be involved in and enjoy was the most important thing. That’s also why it supports up to 6 players, because we didn’t have a lot of non-party games that we could bust out when everyone was together. We have a few more games in various stages of development. The next one is a bit heavier, a unique spaceship management game that is a bit complicated and will appeal to more serious gamers, but there’s no plan only to make a certain “type” of game. More than anything, we want to bring games that fill a niche or gameplay itch that we don’t think currently exists, or adds something interesting to an existing mechanic. We have to get excited about playing our own games or else we’d never want to finish them! 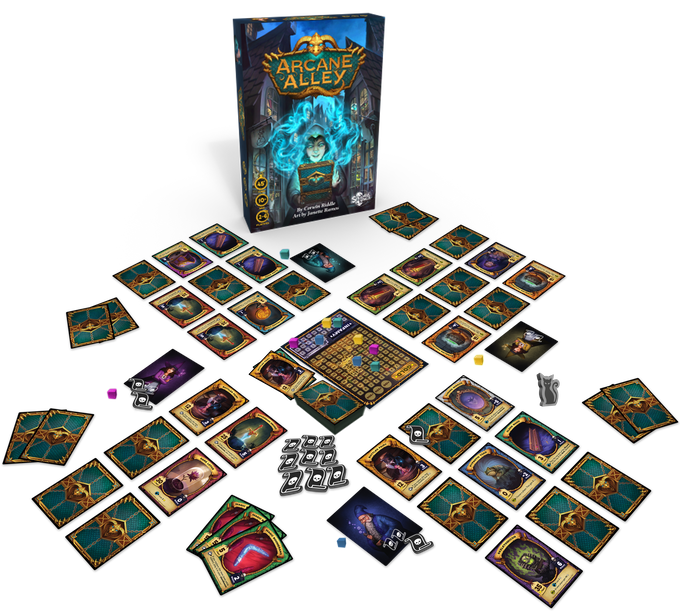 Your first game Arcane Alley is currently being funded through Kickstarter. With all that you have to consider when bringing a game to a crowdfunding site, what do you feel has been the biggest lesson you learned? Compromise. It’s so hard to compromise when you’ve made something and are happy with it. But you have to, because it’s not as simple as a right way or a wrong way to design. It’s that Part A resonates with this group but scares away this other group. Or that Part B is harder to learn but the most rewarding to players, though not all are willing to spend the time to learn it. What do you do? Do you appeal to the most people? Do you decide on a target audience and ignore the others? Obviously there’s a vision, but it needs support to do well, and it’s hard sometimes to know when reconsider something that provides more accessibility and to know when to put your foot down and maintain what you feel is a crucial element of your project. And it wasn’t only design-related. Shipping? Do you go with the cheapest, the fastest, the most reliable but more expensive? The more I learned, the more I realized there wasn’t a magical best solution to each of my problems, and in the end, someone, somewhere (oftentimes me!) will not be completely satisfied with the end result. I felt like I had started on this journey asking myself “What’s the best?” and the closer and closer I got to the end, it became “What’s good enough?”. I think that was necessary — is necessary — most of the time to take a creative project from an idea to a finished product, and it was hard for me accept at first, because of course the only acceptable result is perfection, right? It’s still a little hard to accept sometimes, but I don’t know that things would have moved forward otherwise. I love seeing creators that invest in making their game beautiful. The artwork for Arcane Alley is really solid. Who did you go to for creating the world of Arcane Alley? The artist is Janette Ramos and I found her by browsing DeviantArt. When I saw her page, I knew immediately she was the artist I wanted for the game. Her work was gorgeous and vibrant and yet somehow still had a little bit of grit and creepiness to it, without being too dark or scary or realistic. She did a trial piece first of the Skeletomicon, which is still one of my favorite illustrations in the game. I sent her the worst sketch you’ve ever seen, for general feel and colors and composition, and she came back with what you see on the card and it blew my mind! It was one of the coolest things I’d ever seen, and it was for my game. I mean, until that moment, that card was a skull I drew in MS Paint on a book icon I downloaded from the internet. So, being a professional, I emailed her immediately and begged her to do everything. You normally see games about wizards that cast spells but not many about wizards who are selling goods. Tell us about how you put together the theme for this game. Ha, yeah! This idea was from a Dungeons & Dragon adventure I had written years ago. The D&D group that I run has been playing for years and years, so I always try to throw curve balls when it comes to the typical RPG expectations, to surprise them and make them laugh a bit. For example, they’ll find a group of pacifist goblins living in a peaceful utopia, underground; or a bard that has been trying to start a war between two factions just to have something to write songs about; or, in this case, a city of immensely powerful wizards, who weren’t interested in adventuring or helping others out, and instead created, collected, and sold magic items on the black market to become wealthy. I wanted to bring that kind of fun to the games I make, where the setting is familiar but the theme is something there you might not have thought about before and can get a laugh, without making something intentionally ridiculous. It also made designing item effects a lot easier. If the items are “magical”, they can do anything—nothing is out of the question! In Arcane Alley you’re collecting sets of goods to sell in your market. Tell us about the infamous items that could get you in trouble in this game. I wanted each item to remind players of a famous infamous item from the many magical worlds, with a fitting effect. Almost like off-brand version of the originals. The Invisible Ring (Lord of the Rings) disappears if you drop it. The Magic Boomerang (Zelda) not only comes back, but you can never get rid of it. The Sovereign Sword (Sword in the Stone) doesn’t let you collect any riches until you’ve removed it. My favorite by far is the Haunted Doll. 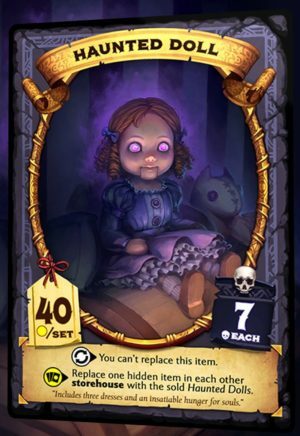 Once she’s in your storehouse, you can never get rid of her, unless you manage to sell them to someone else, in which case she then haunts another player’s storehouse instead. Plus, she has that adorable little stuffed animal dragon with her. We have a lot of 2-player gamers who visit the site. How does a 2-player game differ from a 4-player game of Arcane Alley? The biggest difference in a 2-player game is that the inspection cannot be triggered until the 15th turn, and then is automatically triggered on the 20th turn. This gives you each 15 safe turns to work on your storehouses, then 5 unsafe turns with the option to trigger the inspection, where either player can trigger it to catch the other if they think they’ve overextended, letting players build up and plan without worrying about an inspection being triggered the second their opponent gets ahead. The other difference for a 2-player game is that whenever you replace a hidden card in your storehouse, you put it back in your hand, and then choose any card to discard, instead of automatically discarding the replaced one. 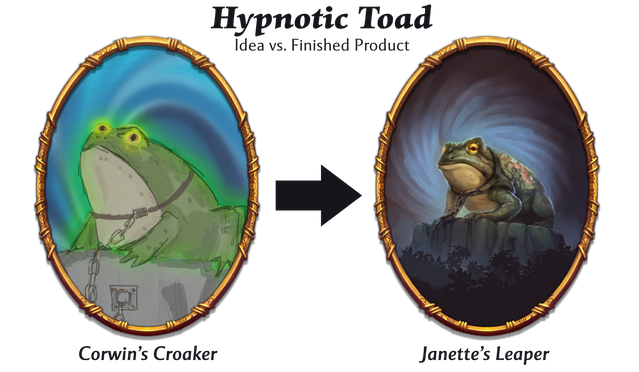 This gives you a lot more control of your own area, as well as what cards your opponent can draw. You’re almost racing, while playing chicken, hiding what sets you could make to trick them into triggering the inspection, while trying to figure out what they’re planning as well. This was really interesting to design and playtest, because it is truly a different game with 2-players, and I think in some way a better game, if you like more control over your tableau. We’re coming to the end of 2018 and we’re constantly pondering this question. What game or game experience has been your favorite of 2018? I might be a little late on this one, but three of my best friends and I finally found the time to consistently start and go through Mechs vs. Minions, and it’s been an absolute riot. The production quality is great, and everything builds so perfectly—the difficulty, new mechanics, and abilities, it’s a great learning curve. We’re always excited to open up the next envelope. You can support the production of Arcane Alley through their Kickstarter campaign until it ends on November 30, 2018. Interview: Toby Fairclough of Mushroom Gaming Co.